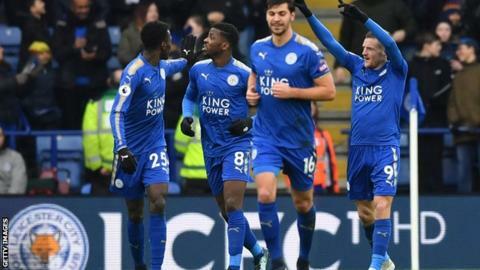 Leicester manager Claude Puel said his side's 1-1 home draw with Swansea "wasn't a fair result" as the visitors extended their unbeaten run in all competitions to seven games. Jamie Vardy slotted home in a first half dominated by the hosts after Kelechi Iheanacho slipped a pass through two Swansea defenders' legs but the Foxes could not find the additional goals their play threatened. Federico Fernandez equalised for an improved Swansea after the break when he headed home a Ki Sung-yueng corner. Riyad Mahrez was again absent following his failed move to Manchester City. "I'm frustrated," said Puel. "It was a a good game against a tough team and they defended very well. "I don't think it is a fair result and we have lost two points." The hosts had plenty of chances in the first half - a goal-line block from Alfie Mawson denied Iheanacho before Wilfred Ndidi had a goal belatedly disallowed for offside. And they came to regret those missed chances as Swansea performed much better in the second half. Fousseni Diabate, Demarai Gray and Harry Maguire had further chances for Leicester in a performance which suggested they were not distracted by Mahrez's continued absence. There were plenty of positives for Claude Puel's side as Leicester looked full of creativity, energy and determination in the first half. All the talk in midweek had surrounded Mahrez's unwillingness to train but on matchday it was clear the Leicester players were keen to show they can still perform without him. And perform they did - as Iheanacho and Diabate lit up the first half with darting runs, skilful touches and intelligent link-up play. Vardy was a constant threat throughout as he chased and hassled for every ball, albeit it to no avail in the second half. Diabate thought he had scored with a powerful strike after 30 minutes but Lukasz Fabianski kept it out and Iheanacho could not convert the rebound as Mawson produced an excellent block on the line with his chest. Swansea managed to come through that period of Leicester dominance only one goal down and ultimately that resilience is what earned them a point - their seventh in three games. Puel tried everything to change the outcome in the second half - bringing on Shinji Okazaki and Gray in attacking substitutions - but Leicester could not find the winning goal their performance deserved. When Carlos Carvalhal took over at Swansea in December, the club sat rock bottom of the Premier League, having won just three league games under Paul Clement. The Portuguese may have looked at his fixtures schedule for the new year and predicted a tough start to his managerial stint but it has proven hugely positive. Since suffering a 2-0 defeat against Tottenham at the start of January, Swansea have gone seven games without defeat in all competitions - picking up crucial wins against Liverpool and Arsenal in their past two league games. And Fernandez's equaliser ensured Swansea moved out of the relegation zone on goal difference. They remain unbeaten on the road under Carvalhal but the Swans will welcome back-to-back home games against Notts County in the FA Cup and Burnley in the league, where they will hope to continue building momentum. Swansea manager Carlos Carvalhal: "I am happy with one point. We have lost the last seven here. "We had a bad first half and then we corrected things. We did much better in the second half. "We were planning to give more pace in attack with Wilfried Bony, but in the last 10 minutes Leicester were more organised in attack, and created more noise." Leicester manager Claude Puel: "I'm frustrated. It was a a good game against a tough team and they defended very well. I don't think it is a fair result and we have lost two points. "We had to score more in the first half. Congratulations to Swansea, but we deserved to win. We finished strong but we didn't get the result in the end. On Riyad Mahrez's absence: "I just need to think about the players available. I know in my mind the most important thing is just to consider my team. I am disappointed about it all." Jamie Vardy has scored the opening goal in six Premier League games this season - no player has done so more often (same as Sergio Aguero and Harry Kane). The Foxes are unbeaten in their past 14 home games against Swansea in all competitions (W10 D4), since a 3-2 defeat in October 1950. After a run of seven consecutive away defeats in the Premier League, the Swans are unbeaten in their past three on the road (W1 D2). Swansea's equaliser came from their only shot on target in the match. Leicester have lost just one of their past seven home Premier League games, winning four and drawing two. Swansea host Notts County in their FA Cup fourth-round replay on Tuesday (20:05 GMT) before Burnley travel to the Liberty Stadium in the Premier League on Saturday (15:00 GMT). Leicester will travel to the Etihad to take on leaders Manchester City in Saturday's late Premier League game (17:30 GMT). Match ends, Leicester City 1, Swansea City 1. Second Half ends, Leicester City 1, Swansea City 1. Attempt blocked. Marc Albrighton (Leicester City) right footed shot from the right side of the box is blocked. Substitution, Swansea City. Wayne Routledge replaces Jordan Ayew. Offside, Leicester City. Harry Maguire tries a through ball, but Jamie Vardy is caught offside. Corner, Leicester City. Conceded by Kyle Naughton. Corner, Leicester City. Conceded by Tom Carroll. Attempt blocked. Demarai Gray (Leicester City) right footed shot from the centre of the box is blocked. Assisted by Harry Maguire with a headed pass. Substitution, Leicester City. Shinji Okazaki replaces Danny Simpson. Attempt missed. Harry Maguire (Leicester City) header from the left side of the six yard box is close, but misses to the left. Attempt missed. Demarai Gray (Leicester City) right footed shot from the centre of the box is too high. Assisted by Christian Fuchs with a cross. Substitution, Swansea City. Wilfried Bony replaces Nathan Dyer. Substitution, Leicester City. Demarai Gray replaces Kelechi Iheanacho. Substitution, Leicester City. Matty James replaces Adrien Silva. Attempt missed. Fousseni Diabaté (Leicester City) left footed shot from the centre of the box misses to the left. Assisted by Jamie Vardy following a fast break. Attempt missed. Jamie Vardy (Leicester City) right footed shot from a difficult angle and long range on the right misses to the left. Assisted by Marc Albrighton. Attempt blocked. Sam Clucas (Swansea City) left footed shot from the centre of the box is blocked. Assisted by Alfie Mawson. Attempt missed. Sam Clucas (Swansea City) header from the centre of the box misses to the right. Assisted by Mike van der Hoorn with a cross. Attempt saved. Kelechi Iheanacho (Leicester City) left footed shot from outside the box is saved in the centre of the goal. Attempt missed. Harry Maguire (Leicester City) header from the centre of the box misses to the left. Assisted by Marc Albrighton with a cross following a set piece situation. Goal! Leicester City 1, Swansea City 1. Federico Fernández (Swansea City) header from the centre of the box to the bottom right corner. Assisted by Ki Sung-yueng with a cross following a corner.